ALBANY, Or. (December 6, 2017) – While most drivers will have to wait for the spring to come about before resuming their racing careers that will not be the case for Bricen James. The Albany, Oregon native will be back in action in January for the 2018 Chili Bowl Nationals piloting the Johnny Herrera Racing #45X entry prepared by legendary car owner/crew chief Kenny Woodruff. James will be one of over three hundred drivers expected to make the trip to the Tulsa, Oklahoma event. 2017 was quite the successful season for James. That was until he would be sidelined for the rest of the Oregon campaign after sustaining a broken kneecap on September 9th during a 360 Sprint Car race at Cottage Grove Speedway. Since then his body has amazingly healed quicker than anticipated to where he is one-hundred-percent fit and is completely cleared by physicians. In fact, he did manage to race in November’s Duel In The Desert event in a IMCA Modified at The Dirt Track at Las Vegas Motor Speedway. 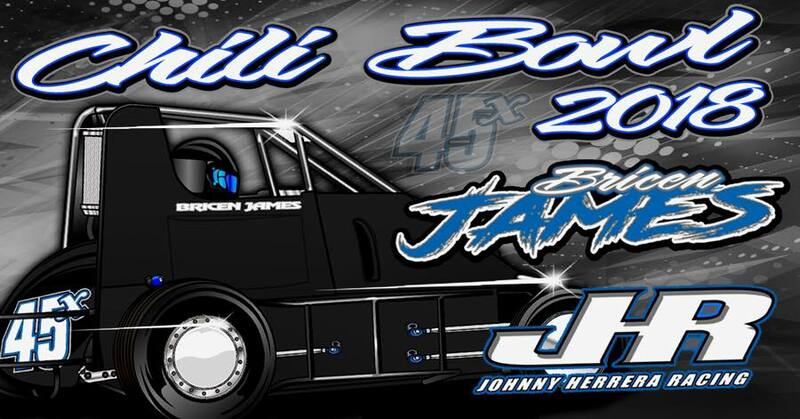 It will be the second occasion that James has participated in the prestigious Chili Bowl Midget Nationals. Last year he was the third highest finishing rookie and place fifty-sixth overall making it as high as the C Main. One of the biggest highlight however was when he was the flag bearer of his native Oregon for the Parade Of Flags. This will be his first time getting behind the wheel of an Open Wheel car since sustaining his injury last fall. Once the Chili Bowl Nationals have concluded the rest of the 2018 schedule is a bit up in the air. Bricen plans on spending most of the season in his IMCA Modified but as far as when and where he’ll be racing is still to be determined. The James family is reaching out for anyone that can help cover the cost of the ride, travel expenses, or even lodging. If you would like to help feel free to contact his father, Charlie, at (541)-979-8613 for further details. Also, be sure and follow James Gang Racing on Facebook for some cool stuff you can get if you donate. As of this moment T-Shirts are currently on sale with all proceeds going towards the trip. The Chili Bowl was founded in 1987 by Emmett Hahn and Lanny Edwards and is dubbed the “Super Bowl of Midget racing”. The race is a weeklong extravaganza featuring nearly three-hundred drivers from all over with all sorts of different racing backgrounds. The finale has been won by legendary drivers such as Sammy Swindell, Kevin Swindell, Lealand McSpadden, Andy Hillenburg, Tony Stewart, Billy Boat, Rico Abreu and Dave Blaney to name a few. The late Midget greats Bryan Clauson and Rich Vogler have hoisted the champion’s trophy on high while 2017 NASCAR Camping World Truck Series champion and Turkey Night Grand Prix winner, Christopher Bell, is the defending Chili Bowl victor. Bricen James is a second-generation driver from the town of Albany, Oregon. James’ father, Charlie, was a two-time Willamette Speedway, in Lebanon, Oregon, track champion back in the 1990’s. Bricen won three titles in the same year at Willamette in 2014 as well as winning a championship at Salem Indoor Speedway earlier in his career. Other notable wins on his resume includes the 2015 triumph at the Big Sky Kartway’s Wild West Shootout in Missoula, Montana. In 2017 he would win the IMCA Modified portion of the Strawberry Cup at Willamette Speedway. Johnny Herrera is a veteran racer from the American Southwest. Herrera is a former World of Outlaw Sprint Series Rookie of the Year, Kings Royal winner at Rossburg, Ohio’s famed Eldora Speedway, and has two track championships at Knoxville Raceway in Iowa. Herrera also has a Midget title to his credit back in 2008 with the New Mexico Midget Racing Association. Kenny Woodruff is a legendary crew chief as well a former Sprint Car owner and has worked with an all-star cast of drivers. In 1978 his very own car, driven by Jimmy Boyd, would win the first ever World of Outlaw Sprint Series race at Devil’s Bowl Speedway in Mesquite, Texas. Indiana legend Danny Smith also drove for him. Among the many notable drivers, Woodruff would wrench for were Doug Wolfgang, Sammy Swindell, Danny Lasoski, Lealand McSpadden, Jeff Swindell, Steve Kinser, and Johnny Herrera. Kenny would spend a few years with Bobby Davis Jr. before they moved to the prestigious Beverly and Casey Luna team and won an Outlaw title in 1989. In 1993 Dave Blaney would join the team and remain there for five years and would win a World of Outlaw championship, in 1995, as well as two King’s Royals at Eldora, a Gold Cup at Chico, California’s Silver Dollar Speedway, and the 1997 Knoxville Nationals. Eventually Kenny hooked up with a young man from North Dakota and served as a valuable mentor to him. That driver would become one of the most dominant Sprint Car pilots in the last ten years. His name, Donny Schatz. Kenny Woodruff was inducted into the National Sprint Car Hall of Fame in 2005.